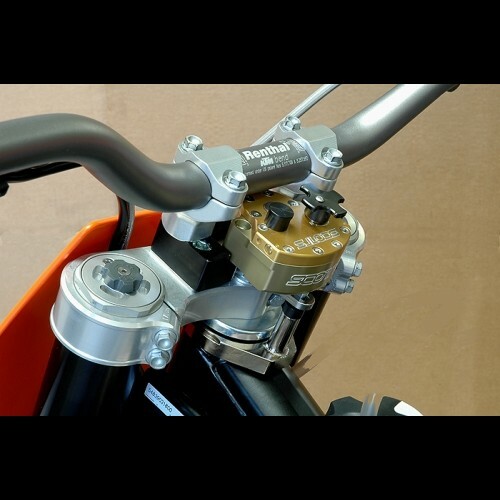 This kit is designed to be used with the stock triple clamp and oversize handlebars.The SUB mount shown here in black, bolts to the stock triple clamp. The stock lower perches then bolt to the SUB mount allowing the stabilizer to slip in under the bars. Your model may have black or Silver triple clamps depending on the bike. The SUB mount utilizes the most popular handlebar position #3, or #4 which is little farther forward. Step by step pictured instructions are included along with all the necessary hardware. Generally, this fits most KTM EXC/SX 2008-2012, but can vary. "SUB" mount stands for Stabilizer Under Bars, an idea we've been using for years, originally designed for raising the bars. This concept now allows more room for other equipment such as a Global Positioning Systems (GPS) or Enduro/Rally computer equipment and still retains the quick access for adjusting the stabilizer. This is also good for the taller rider who wants his bars a little higher, as it raises the bar location approximately 20-25mm, depending on the model. In some cases, you might consider a lower bend bar at the same time, unless you are trying to achieve a higher bar height along with your stabilizer installation. Each SUB mount comes complete with all necessary parts, hardware and "Step by Step" pictured instructions. The Photo attached here may be a generic photo to show you the basic components in the kit, but may not be showing the exact kit for your specific bike.